The Kansas DOT TAMP is available here. The Kansas DOT TAMP documents and organizes the existing asset management practices at the Kansas DOT to optimize investment in highway assets while providing an overview of the improvement actions needed to both increase the asset management maturity of the agency and meet federal requirements. 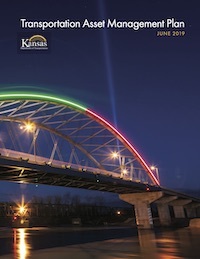 The document establishes Kansas DOT’s objectives for managing the asset base to deliver a defined level of service in the most effective and cost-efficient way and summarizes how Kansas DOT's assets are managed throughout their life cycle. It documents the processes KDOT currently follows to manage assets, along with proposed processes to ensure that progress is made towards compliance with federal asset management regulations. This document includes the following sections: Asset Valuation, Current Methods and Tools, Data Management, Financial Plan, Future Demand, Introduction, Inventory and Condition, Investment Strategies, Lifecycle Management, Objectives and Measures, Process Improvements, Regulatory and Legislative Requirements, Risk Management.